Completed in September 2009, the West Quad Center is the first new building on the Brooklyn College campus in nearly 40 years. The 145,000 sq. ft. glass-fronted structure serves as both a one-stop student services center and the hub of state-of-the-art physical education and recreational facilities. Athletics are spread over three floors, including the lower level that houses the new natatorium. 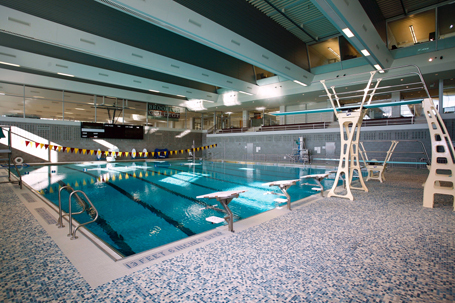 Counsilman-Hunsaker in association with Rafael Vinoly Architects designed the new natatorium to include an eight lane 25-yard competition pool with 1-meter and 3-meter diving boards and a lift for swimmers with disabilities. Not only is the pool open for recreational use for those who wish to swim a few laps but the new pool has also resurrected the men’s and women’s swim teams. Adjacent to the pool are two weight and fitness rooms, equipment check-out counter, and four sets of locker and shower rooms.